One of the neat things we explored in Hollywood Studio is the spectacular journey into the movies. We took a ride and the tour guide showed us some beautiful parts of different movies. Our princesses awaiting for some magical moments to happen hehehe. Not sure if you can recognize some of these. Mary Poppins, remember that? I'll post some more next time. We should have went to Disney Junior coz it's more for kids. 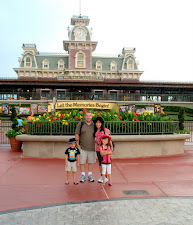 There are so many things we did not see in Disney due to time constraints. Thanks for leaving a comment or two, your visit and ideas means a lot! pa copy nang pics...lol! madami kaya tayong d napuntahan...lol...sa haba ba naman nang linya....hehehhe! These are also spectacular photos you shot at Hollywood studios. The picture of Rylie and Akesha is very heartwarming. They really hit it right from the start as though they are long lost friends. Thanks for the post. God bless you all always. Hope you'd find time to visit me here. Looks like your kiddos are having a great time. Beautiful family! A wonderful place for families to spend quality time together. We hope the attractions we pick out for our little ones are as exciting for them as the parents think. She seems to think so, the smile in anticipation of seeing something special. What mom and dad think she would like. And she will! Disney is so much fun, you never have enough time! Two cute little girls. Looks like a fun time! Very interesting shots. Thanks for taking us on the tour. ang cute ng dalawang princesses oie! kakaingit! just dropping by from Orange Tuesdays! Here's my entry, hope can hop there..see yah around! Beautiful photos. This is one of the places that I love to visit one day. Love that pic of Akesha and Rylie. visting from RT mommy rose! wow! grabee! ganda naman jan..
hi mommy! thanks for joining OT..
now i miss Disney. it's great to be a kid. thank you for the visit. happy RT! Lots of red - and lots of fun - in these photos. Your daughters are beautiful. I'm sure they had a good time. the first snaps looked like moulin rouge to me, then i scrolled down its kiddie theatre pala. I love Mary Poppins and have been a fan of Julie Andrews since i first saw the movie. Hope you're having a fab week, check out my orange entry this week.